Carnegie Mellon University convened industry professionals, faculty and researchers for the 14th annual Simon Initiative LearnLab Summer School in late July. Working together in teams of two or three, participants learned about technology-enhanced learning (TEL) while gaining a conceptual background and considerable hands-on experience in designing, setting up and running TEL experiments. Participants also learned how to analyze the data from those experiments using CMU's advanced tools. Vasudeva Rao Aravind, a physics professor at Clarion University and a previous summer school attendee, knew exactly where his students faltered in his course for non-physics majors. He was able to calculate this thanks to last year's program, where he learned to build a cognitive tutor to assist his students where they needed it most. When Aravind returned to the five-day program in 2018, one day was all it took for him to make significant improvements. "LearnLab Summer School has empowered me with the knowledge to make my own tutor based on my own teaching style and my students' learning styles. And now, I can analyze the student data to see where the tutor is doing well and where it could be better," Aravind said. CMU has offered the summer school since 2005 to focus on creating TEL experiments and building intelligent tutoring systems. Thanks to redesign and improvements in the tools, this year's participants were able to accomplish more, faster. "The Open Learning Initiative, which is used for course creation, and LearnSphere, which is used for data analysis, have both significantly matured. Participants were able to demonstrate concepts and skills by the end of the first day that past participants typically did not get to until the third day," Program Facilitator Michael Bett (CS '86, TPR '00) said. Bett, who is also the managing director of the Master's in Education Technology and Applied Learning Science (METALS) program, said that interactions with the program's mentors and researchers were integral to the success the 55 participants. The mentors shared new developments and guided participants in trying out tools and analyzing data. Lauren Dahlin, a doctoral candidate in information systems at the University of Maryland's Smith School of Business, had only just met the two people on her project team. She appreciated the social aspects of the program. "The biggest takeaway for me has been the connections with people working in learning science, psychology, political science and sociology. I feel I make progress by talking with them and gaining exposure to all the different fields," Dahlin said. Project work is an essential part of the program. Participants need to prep and plan before arrival, but no programming knowledge is required. The tools participants use include CMU's Cognitive Tutor Authoring Tools (CTAT), Open Learning Initiative (OLI) development environment, DataShop and others, which CMU has advanced over the years. The OLI interface, for example, allows users building an online course to drag-and-drop content where it used to require markup language. "Over the course of the week I gained an understanding of how OLI works and how it's designed to benefit learners," Jonathan Epps said. Epps, a political science major at Morehouse College, partnered with Andrés Gómez-Colunga, a mathematics major at Yale University. Both are summer research assistants in CMU's Psychology Department, and they collaborated on a project to refine an online introductory statistics course for CMU's Program for Interdisciplinary Education Research—Research Experience for Undergraduates (PIER REU), which provides research opportunities to undergraduates who are considering graduate training in the field of learning science. "LearnLab Summer School aligned perfectly with the end of our PIER REU program," Gómez-Colunga said. LearnLab Director Ken Koedinger said CMU has made the tools easier to use, but he also credits participants for coming prepared to use the tools rather than only learn about them. Koedinger, the Hillman Professor of Computer Science and a member of the Simon Initiative Leadership Team, likes to see educators like Aravind attending for multiple years. "Aravind is a good example of the transformation educators experience at LearnLab Summer School because he came from the perspective of learning how to use our tools and now he's helping to make cognitive tutors better," said Koedinger. "They go from learning to teach to teaching to learn." Aravind agreed and said, "When I came here last year, I had an idea of what kind of tutor I wanted to make. I literally just had the idea, and they helped me build the tutor from scratch. This year, I was trying to see how well my tutor performs." 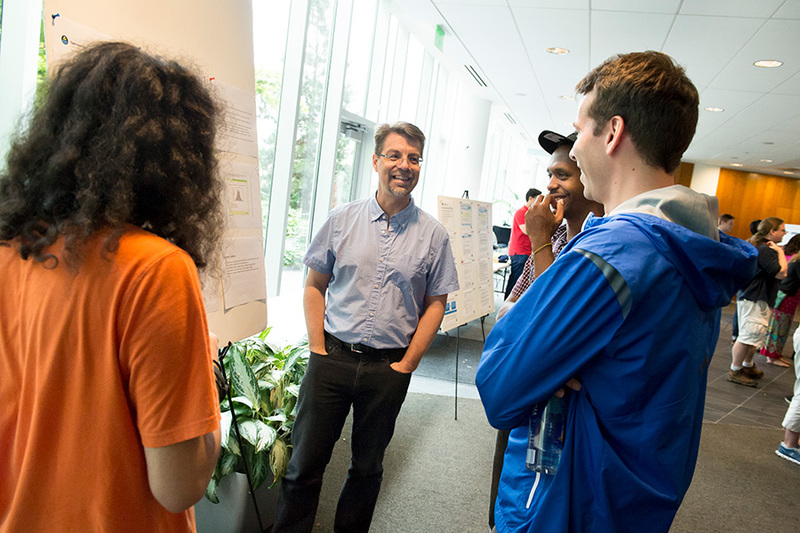 In the above picture, Ken Koedinger talks to students about their Simon Initiative LearnLab Summer School projects.